قربانی, ارسلان, کشوریان آزاد, محسن. (1396). بررسی جنبش‌های اجتماعی خاورمیانه از نظرگاه نظریه انتقادی مکتب فرانکفورت. پژوهش های روابط بین الملل, 7(25), 15-40. ارسلان قربانی; محسن کشوریان آزاد. "بررسی جنبش‌های اجتماعی خاورمیانه از نظرگاه نظریه انتقادی مکتب فرانکفورت". پژوهش های روابط بین الملل, 7, 25, 1396, 15-40. قربانی, ارسلان, کشوریان آزاد, محسن. (1396). 'بررسی جنبش‌های اجتماعی خاورمیانه از نظرگاه نظریه انتقادی مکتب فرانکفورت', پژوهش های روابط بین الملل, 7(25), pp. 15-40. قربانی, ارسلان, کشوریان آزاد, محسن. بررسی جنبش‌های اجتماعی خاورمیانه از نظرگاه نظریه انتقادی مکتب فرانکفورت. پژوهش های روابط بین الملل, 1396; 7(25): 15-40. 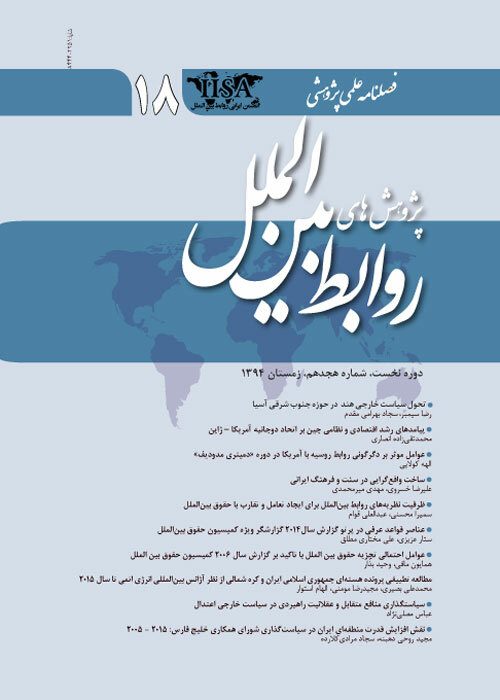 این مقاله به بررسی جنبش‌های اجتماعی خاورمیانه در سال 2011 از منظر نظریه انتقادی مکتب فرانکفورت می­پردازد و در پی آن است تا نشان دهد که چگونه نظریه انتقادی متأثر از مکتب فرانکفورت قادر به تحلیل مسائل نظام بین‌الملل ازجمله جنبش‌های اجتماعی منطقه­ی خاورمیانه می­باشد. بنابراین با به کارگیری و کاربست اصول، مفروضه­ها و مفاهیم این نظریه تلاش می­شود به این پرسش اساسی پاسخ داده شود که نظریه انتقادی مکتب فرانکفورت چگونه می­تواند جنبش‌های اجتماعی خاورمیانه را تحلیل کند؟ به سخن دیگر آیا می­توان نظریه انتقادی را به‌عنوان چارچوب مفهومی و نظری برای تحلیل خیزش‌های مردمی خاورمیانه به کار برد؟ فرضیه‌ای که در پاسخ به این پرسش مطرح می­شود عبارت است از اینکه؛ نظریه انتقادی مکتب فرانکفورت با تأکید بر مفاهیمی همچون تغییرپذیری و دگرگونی از طریق عمل انسانی، آگاهی بشر و نقش سوژه اجتماعی، رهایی، کاهش نابرابری، برقراری عدالت، بهبود زندگی اجتماعی، محرومیت و گفتگو در عرصه عمومی برای نیل به هدف؛ که همه این عوامل مستلزم کنش انقلابی است، می­تواند الگوی تحلیلی مناسبی برای جنبش‌های اجتماعی خاورمیانه باشد. نوع تحقیق حاضر توصیفی-تحلیلی است و با توجه به ماهیت و نوع موضوع مورد مطالعه، گردآوری اطلاعات از روش‌های گوناگون و به‌طور کلی بر مبنای روش اسنادی صورت پذیرفته و تجزیه و تحلیل یافته‌ها نیز عمدتاً با شیوه تحلیل کیفی انجام پذیرفته است. This article studies the Middle East social movements in 2011 according to Critical Theory of the Frankfurt, seeking to demonstrate how Critical Theoryof the Frankfurt School is able to analyze the issues of the international system, including Middle East social movements. Making use of principles, assumptions and concepts of this theory, we attempt to address this basic question as to how Critical Theory of the Frankfurt School can analyze the Middle East social movements. In other words, is it possible to employ Critical Theory as a conceptual and theoretical framework in analyzing civil uprisings in Middle East? An assumption which is taken into account to address this inquiry involves: Is Critical Theory of any avail in being a proper analytical model for social movements in Middle East, regarding the fact that Critical Theory of the Frankfurt School emphasizes on concepts such as variability and transformation by virtue of human action, human knowledge and role of the social subject, liberty, diminishing inequality, upholding justice, improving the social life, deprivation, and public dialogue as to achieve the goal, all of which require revolutionary action. The type of this study is descriptive-analytical. Considering the nature and type of the study, information is compiled through several ways, generally speaking, based on library and internet method. Results are mainly obtained using qualitative analysis. باتامور، ت. 1375. مکتب فرانکفورت، ترجمه حسینعلی نوزی، تهران: نشر نی، ص36. برچیل، ا و لینکلینتر، آ .1392. نظریه­های روابط بین­الملل، ترجمه سجاد حیدری قر، تهران: انتشارات جهاد دانشگاهی، ص 188. برچیل، اسکات و همکاران (1391)، نظریه­های روابط بین­الملل، ترجمه حمیرا مشیر زاده و طالبی آرانی، تهران: نشر میزان. دوناتلا، د و دیانی، م .1384. مقدمه­ای بر جنبش­های اجتماعی، ترجمه محمدتقی دلفروز، تهران: انتشارت کویر، ص81. قوام، ع.1388. روابط بین‌الملل: نظریه­ها و رویکردها، تهران: سمت، ص 197. لارنا، ا و همکاران .1387.جنبش­های نوین اجتماعی، ترجمه محمد کمال سروریان و علی صبحدل، تهران: پژوهشکده مطالعات راهبردی، چاپ اول. مشیر زاده، ح .1390. تحول در نظریه­های روابط بین‌الملل، تهران: انتشارات سمت. هولاب، رابرت؛ هابرماس، یورگن .1375. نقد در حوزه عمومی، ترجمه حسین بشیریه، تهران: نشر نی. Agger, Ben(1989) On happiness and the damaged life, in John Oneill edited, On critical theory, Lanham University press of American. Ashley, R. K. (1981). Political realism and human interests. International Studies Quarterly, 25(2), 204-236..
Burchill, S., Linklater, A., Devetak, R., Donnelly, J., Nardin, T., Paterson, M., ... & True, J. (2013). Theories of international relations. Palgrave Macmillan. Charles, T. (2004). Social Movements. Boulder. Colo.: Paradigm.‏. Christopher, A. (2010). Tunisia: Stability and Reform in the Modern Maghreb. Abingdon: Routledge. Cox, R. (2002), "Universality in International Studies: A Historical Approach" In Harvey and Brecher, eds, Critical Perspectives in International Studies, Ann Arbor, University of Michigan Press. Devetak, R. (1996), “Critical theory” in Burchill, S. and Linklater, A Theory of International Relations, Londan: Macmillan. Goldstone, Jack A. 2011) (“Understanding the Revolutions of 2011”, Foreign Affairs, May/ June: http://www.foreignaffair.com/articles/67694/Jack-agoldston/understanding goldston/understanding-the -revolution-2011. Gottlieb, R (1993) History and Subjectivity new jercy, Humanity press. Habermas, J (1981, The Theory of Communicative Action, Reason and the Rationalization of Society, Translated by: Thomas McCarthy Boston: Beacon Press, vol. p.361. Hamel, Pierce and Maheu, Louis (2006), "the Politics of collective identity and action", in Kate Nash and Alan Scot (eds), the Political Sociology, Blackwell Publishing. Hassan,) 2011(, Social Policy in the Arab World and Social Justice, in www.articlesbase.com/culture/article-375/2011. Horkheimer, M. (1974). Eclipse of reason (Vol. 1). Bloomsbury Publishing. Horkheimer, Max & Adorno, Theodor W. (2002) Dialectic of Enlightenment: Pholosophical Fragment, edited by Gunzelin Schmid Noerr, translated by Edmund Jephcott, Stanford, -California: Stanford University Press. Linklater, A. (2007). Critical theory and world politics: citizenship, sovereignty and humanity. Routledge. Moolakkattu, J. S. (2009). Robert W. Cox and critical theory of international relations. International Studies, 46(4), 439-456. Opp, K. D. (2009). Theories of political protest and social movements: A multidisciplinary introduction, critique, and synthesis. Routledge. Petherbridge, D. (Ed). (2011). Axel Honneth: Critical Essays: with a Reply by Axel Honneth (Vol. 12). Brill. Risse, T. (2000). “Let's argue!”: communicative action in world politics. International organization, 54(1), 1-39. Rush, F. (Ed.). (2004). The Cambridge companion to critical theory. Cambridge University Press.‏- Stepanova, E. (2011). The role of information communication technologies in the “arab spring”. Ponars Eurasia, 15, 1-6. Stephen, B (1994) of critial theory and its theorists, oxford: Blackwell. Weber, M. (2005). The critical social theory of the Frankfurt School, and the ‘social turn’in IR. Review of International Studies, 31(1), 195-209.